A beautiful stacking ring set personalized with the names of children or date of your choice- perfect gift for a mom of one or two to keep her loved ones close. textured stacking band measures 2mm. 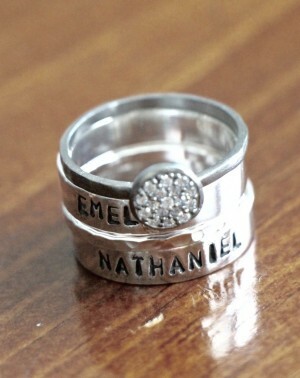 Categories: Collections, Hand Stamped Rings, Mom and Grandma Gifts, new, Rings, Stackable Rings.